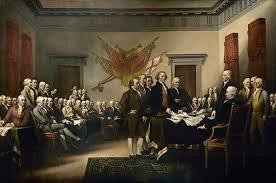 Faced with the death penalty for high treason, courageous men debated long before they picked up the quill pen to sign the parchment that declared the independence of the colonies from the mother country on July 4, 1776. For many hours they had debated in the State House at Philadelphia, with the lower chamber doors locked and a guard posted. According to Jefferson, it was late in the afternoon before the delegates gathered their courage to the sticking point. The talk was about axes, scaffolds, and the gibbet, when suddenly a strong, bold voice sounded – “Gibbet! They may stretch our necks on all the gibbets in the land; they may turn every rock into a scaffold; every tree into a gallows; every home into a grave, and yet the words of that parchment can never die! They may pour our blood on a thousand scaffolds, and yet from every drop that dyes the axe a new champion of freedom will spring into birth! The British King may blot out the stars of God from the sky, but he cannot blot out His words written on that parchment there. The works of God may perish: His words never! “The words of this declaration will live in the world long after our bones are dust. To the mechanic in his workshop they will speak hope: to the slave in the mines freedom: but to the coward kings, these words will speak in tones of warning they cannot choose but hear. “Sign that parchment! Sign, if the next moment the gibbet’s rope is about your neck! Sign, if the next minute this hall rings with the clash of falling axes! Sign, by all your hopes in life or death, as men, as husbands, as fathers, brothers, sign your names to the parchment, or be accursed forever! Sign, and not only for yourselves, but for all ages, for that parchment will be the textbook of freedom, the bible of the rights of man forever. “Nay, do not start and whisper with surprise! It is truth, your own hearts witness it: God proclaims it. Look at this strange band of exiles and outcasts, suddenly transformed into a people; a handful of men, weak in arms, but mighty in God-like faith; nay, look at your recent achievements, your Bunker Hill, your Lexington, and then tell me, if you can, that God has not given America to be free! “It is not given to our poor human intellect to climb to the skies, and to pierce the Council of the Almighty One. But methinks I stand among the awful clouds which veil the brightness of Jehovah’s throne. Methinks I see the recording Angel come trembling up to that throne and speak his dread message, ‘Father, the old world is baptized in blood. Father, look with one glance of Thine eternal eye, and behold evermore that terrible sight, man trodden beneath the oppressor’s feet, nations lost in blood, murder, and superstition, walking hand in hand over the graves of the victims, and not a single voice of hope to man!’ “He stands there, the Angel, trembling with the record of human guilt. But hark! The voice of God speaks from out the awful cloud: ‘Let there be light again! Tell my people, the poor and oppressed, to go out from the old world, from oppression and blood, and build My altar in the new.’ “As I live, my friends, I believe that to be His voice! Yes, were my soul trembling on the verge of eternity, were this hand freezing in death, were this voice choking in the last struggle, I would still, with the last impulse of that soul, with the last wave of that hand, with the last gasp of that voice, implore you to remember this truth–God has given America to be free! The unknown speaker fell exhausted into his seat. The delegates, carried away by his enthusiasm, rushed forward. John Hancock scarcely had time to pen his bold signature before the quill was grasped by another. It was done. The delegates turned to express their gratitude to the unknown speaker for his eloquent words. He was not there. Who was this strange man, who seemed to speak with a divine authority, whose solemn words gave courage to the doubters and sealed the destiny of the new nation? His name is not recorded; none of those present knew him; or if they did, not one acknowledged the acquaintance. How he had entered into the locked and guarded room is not told, nor is there any record of the manner of his departure. Want to received our latest blog post? Simply provide your email in the box on the left hand side of this page.